Extra police were at rail stations across Surrey on Thursday to cope with the aftermath of the London explosions. Emergency, health and government bodies set to deal with missing people and potential transport chaos were treating their response as "a major incident". Ambulance crews from Kent and Surrey were deployed to London after the bomb attacks. Sussex Ambulance sent crews to cover the counties. People were asked not to dial 999 unless absolutely necessary. A spokesman for Surrey Police said officers would be available to take witness statements from any commuters who may have seen anything suspicious earlier in the day. Kent Police said security had been increased across key transport routes, ports and airports as a precaution. It said the Port of Dover and Eurotunnel were operating normally on Thursday, but at an increased security level. Kent Ambulance Service was later stood down but residents were asked to avoid dialling 999 for a few hours. Members of the public were being advised not to travel into London. South Eastern Trains and Southern Railway said they were still running a service in and out of the capital but only to enable people to leave the city. Flights at Gatwick Airport were operating as normal, although trains to the airport were halted for much of the day. A separate security alert at Brighton railway station led to its closure, along with surrounding roads, while an abandoned briefcase was examined. Bomb disposal teams dealt with the incident, and a controlled explosion was carried out. The station reopened at 1400 BST. At least 12 Kent schools who had pupils on trips heading into London early on Thursday were known to be safe and returning home. Sixteen-year-old George O'Connell, from Deal in Kent, has spoken of the moment he thought he had "suddenly died" when the tube train he was travelling on plunged into darkness. George had got on the Tube at Barking but when it pulled out of Liverpool Street Station a "huge explosion blew the windows out and everything just blacked out". He said the doors were blown open and he was able to crawl out of the carriage and walk along the track towards Aldgate. "I heard people screaming in pain and banging on the carriage doors pleading for help." 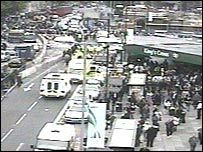 BBC News reporter James Clarke, from Hastings, was also in London at the time and had walked past King's Cross Station just moments after one of the explosions. "It was absolute chaos outside King's Cross, I've heard siren after siren. "It's not a state of panic but it's like nothing I've ever seen before," he said.